Join Team P2G and race through the historic streets of Oxford to help us change, transform and save lives across Oxfordshire. We are Play2Give and we help local people and local causes. We help change, transform and save lives all year round. We support, raise funds and awareness for a number of local charities from Oxford Children's Hospital and Ronald McDonald House to Headway Oxfordshire and Footsteps Foundation and more. We want to raise just as much as we can throughout 2018 after our successful tenth anniversary year in 2017 saw us raise nearly £20,000 for the Children's Hospital and Headway. Run for P2G at the Oxford Half Marathon and help us help even more! 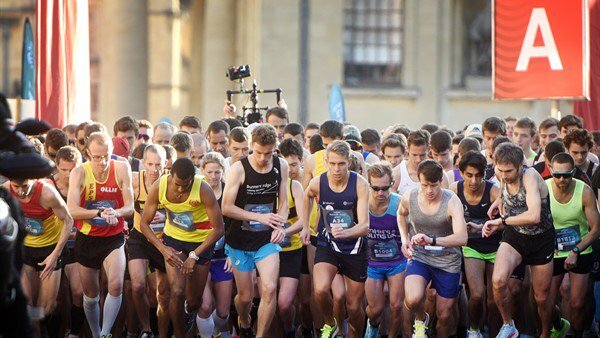 The Oxford Half Marathon is a fast and flat 13.1-mile route weaving in and around the city of dreaming spires showing some of Oxford's most iconic landmarks. Starting and finishing in the city centre, this race takes runners over the River Cherwell and out to the charming village of Old Marston before looping back past the impressive University colleges. Join Team P2G for a fantastic first-hand way to see this beautiful and historical city! In 2017 we had two runners take part. George Welch, reporter at The Oxfordshire Guardian, ran alongside his partner Emma, and between them they helped to raise £270 towards Play2Give's 10th Anniversary Appeal. The Oxfordshire Guardian and The Oxford Paper - for which George is a journalist - chose P2G as their 2017 Charity of the Year helping us to increase our awareness and funds throughout the course of a year, which was an extremely valuable relationship for us. We are also extremely lucky to have had other runners - men and women - take part in this run as well over the years to support us, and we thank them all! Great! Contact us to arrange your fundraising to benefit Play2Give and we will still support you in the same way. Oxford's glorious city centre route begins on Broad Street, starting you off on the right foot near Trinity College and the Clarendon Building. Once you pass through the charming village of Old Marston, you will cross the River Cherwell and whip back around Oxford University's impressive Lady Margaret Hall, and then right again onto Norham Gardens. Finish strong back into the City Centre, through Radcliffe Square and into the final stretch of the stunning Radcliffe Camera. P2G is all about changing, transforming and saving lives across Oxfordshire, see video right. Oxford Children's Hospital - reg. charity 1175809. The Oxford Children's Hospital Charity raises funds to provide medical equipment research and comfort items above and beyond NHS standard as well as play for entertainment and recovery. Current fundraising is helping to fund the creation of new parent accommodation, new play areas and specialised medical equipment. Headway Oxfordshire - reg. charity 1156538. Headway Oxfordshire provides advice practical support and rehabilitation to adults with brain injuries and their families affected by brain injuries.